Warning: this film is ridiculous. 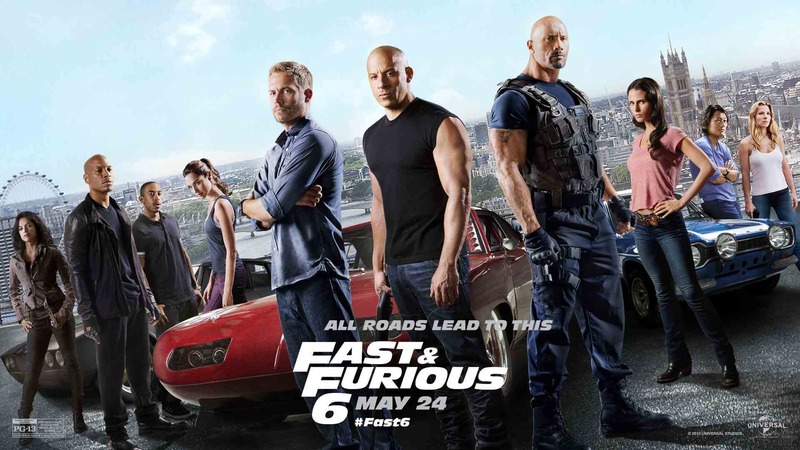 Now we’ve got that out of the way, Fast & Furious 6 has emerged onto our screens – the sixth Fast film in twelve years – and there are no signs of slowing down. The action starts as mumbly Dom (Diesel) and Brian (Walker) are speeding through mountains to the birth of Brian’s first child. But there’s no time to settle into family life. US Federal agent Hobbs (played by the massive Johnson) summons the help of these on-the-run crims to help chase down villain Shaw (Luke Evans) who is up to something bad but the plot never really delves into exactly what’s going on. Now it would appear that there is an unspoken rule that when a franchise reaches film number six it’s okay to be as over-the-top as possible. There are scenes in this film – and you’ll know which when you see them – where characters are turned from realistic human beings into computer-generated flying superheroes. There’s car-nage like never before. And there’s a tank on a freeway. So be warned – if you want a well-constructed story, you’re not going to find it here. But if you want to see stuff get destroyed, Fast 6 has your back. I was left wondering what they do when they want fuel. Do they just go to the corner servo? The strange thing about this movie is that good agent Hobbs uses these on-the-run crims to do his work for him, even though they are bad. And Hobbs has the power to redeem them and wipe their criminal record so they can walk free again. We might not be avoiding extradition but we are all corrupt in some way too. It’s the sin inside us that makes us want to have control – drive fast, chase down wealth, have the carefree life – you name it. Clearly no one who relies on the law is justified before God, because “the righteous will live by faith.”The law is not based on faith; on the contrary, it says, “The person who does these things will live by them. Christ redeemed us from the curse of the law by becoming a curse for us, for it is written: “Cursed is everyone who is hung on a tree.”He redeemed us in order that the blessing given to Abraham might come to the Gentiles through Christ Jesus, so that by faith we might receive the promise of the Spirit. Like these speed-loving rebels, we’re outside the law. And just like Hobbs, Jesus enters into this lawless world with the power to redeem us from it. But Jesus gives us the ultimate freedom – forgiveness from our sins and eternal life that goes with it. The Fast franchise has evolved well but I fear for the believability of the stunts that might appear in Fast 7, due out July 2014. I’m giving Fast 6 3 out of 5 stars. Posted in 2013, Film ReviewsTagged 2013, christian, fast & furious, fast & furious 6, fast 6, film review, movies, reviewBookmark the permalink.